PPF's question today is about the role of a muse in our work. I can't really name a muse, except I do have a very active dream life that is very often the source for my ideas. So, while I don't have a particular muse, I guess dreaming could be considered a "muse state for me". Happy PPF! This is really gorgeous - love the soft style and the blues here. THis is wonderful! I love it!! THIS is me! I guess you could have found me in your watch list too. Ahhhh...how I wish that was me! Beautiful! This is a powerful piece, I love your term "magic realist"! Wow, you have perfectly captured a dream state. How awesome. Beautiful and whimsical. I love your art...HAPPY PPF! nice work, glad you identified your muse, I'm still not sure. Not only is your painting beautiful, but it also has a wonderful sense of serenity and calmness to it. Very magical. Beautiful, I love that everything is in shades of the night. Oh now, I really like this. The blues, how she is looking so relaxed. I love it! Good work. Happy PPF! Have a great weekend. So lovely! I wish my dreams were more like this. I tend to have either nightmares or crazy dreams. I dreamed recently that my son's best friend gave me a chicken on a barbed wire leash as a pet. Do you think that would make a good painting, LOL? Nah! Such beautiful colors and I always love your style... this has an Henri Rousseau "Sleeping Gypsy" feel to it that I think is fabulous! This is a really beautiful painting. This is so beautiful! I'd love to have a dream like that! this is fantastic! it is so surreal and really conveys the idea of being in a dream. i love the checkered and softly undulating countryside she is flying over! lovely work! the colors are wonderful! Gorgeous work! I love all the blues. Soft and dreamy. 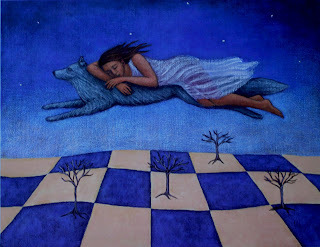 Your dreamscape is magical--it reminds me of the stories in Women Who Run With Wolves. Happy PPF! So pretty, love the movement! Colors are lovely! This piece really conveys that dream-like state so well....beautiful!